The government will work together with its Australian counterpart to address employment and labor force issues, as Indonesia’s demographics could pose challenges for its economy in the long run if not well managed. Indonesia is planning to impose a 22 percent “safeguard” tariff on imports of aluminium foil, it told the World Trade Organization in a filing on Thursday, citing a surge in imports due to surplus flows of the commodity coming from China. Indonesia’s Research, Technology, and Higher Education Ministry is collaborating with the UK Department of Business, Energy, and Industrial Strategy through the Newton Fund-funded three studies in the field of hydrometeorology for the 2019-2021 period. The Indonesian palm oil industry will boycott any talks on indirect land use change (ILUC) impacts of biofuels initiated by the European Commission, arguing that it was part of a European Union plan to scrap CPO from the list of vegetable oils to produce biodiesel. Indonesia, a diverse, archipelago nation consisting of more than 300 ethnic groups, is the seventh largest economy in terms of purchasing power parity, and the largest economy in Southeast Asia. The 14th meeting of an informal partnership between Mexico, Indonesia, South Korea, Turkey and Australia (MIKTA) held in Yogyakarta on Thursday discussed the strength and commitment of member states to contribute to addressing various global issues. The government has issued a regulation over gas networks (Jargas) for households to reduce the consumption of liquefied petroleum gas (LPG) distributed through canisters, which still meet more than half of the national demand. Tangerang Health Department verified that a total of 464 people were infected by HIV/AIDS across 15 sub-districts. Rights watchdog Imparsial has urged the government to continue reforming the Indonesian Military (TNI), including imposing a permanent return to the barracks, amid a plan to allow senior officers to take up posts in various state institutions. The Padang tourism survey board announced that the new paid baggage policy adopted by air carriers caused a 40 percent drop in souvenir sales in Padang City, West Sumatra. The Indonesian government is planning to post some of the dozens of underemployed generals into high-ranking civilian roles, alarming rights groups who see it as a threat to the country’s young democracy. Indonesia has been facing non-military and multi-dimensional threats posed by the drug trafficking, illegal fishing, and illegal logging activities, as well as acts of terrorism and radicalism, a minister said. The Semarang Corruption Court has sentenced suspended Purbalingga regent Tasdi to seven years’ imprisonment and Rp 300 million (US$21,451) in fines for accepting kickbacks and gratuities while serving his post. Indonesia’s Ministry of Energy and Mineral Resources set the price for Minas crude lifted in January at $57.46/b, up $1.83/b from December, according to the monthly selling price notice seen by S&P Global Platts Thursday. The Food and Agriculture Organization (FAO) of the United Nations has urged Indonesia to expand the use of conservation agriculture techniques to develop a more resilient farming and bring wealth to the nation`s farmers. With demand for financial products conforming to Islamic principles soaring, Shariah banking in Indonesia is poised for a phase of rapid growth, according to the nation’s largest Islamic bank. Securing funding for environmentally friendly projects has not been a straightforward process for Indonesian companies and organizations, many of which are unaware that certain standards need to be fulfilled before applying for funding for green energy projects at international and multilateral organizations. The National Campaign Team of Jokowi – Ma’ruf has identified thirteen Indonesian provinces that are at high risk of exposure to hoax news. Indonesia condemns Israel’s unilateral decision to close and end the mandate of international civilian observer mission in Hebron, the Palestinian territory, also called Temporary International Presence in Hebron (TIPH), in West Bank, under Israeli occupation. Over the past week, Muslims all over the world have been pressuring Nike to redesign the logo on the soles of their Nike Air Max shoes because it allegedly resembles the Arabic script for “Allah” (God). Indonesian police found 193 Bangladeshis locked up in a shop house after human traffickers had lured them with the promise of getting them to Malaysia, an immigration official said on Thursday (Feb 7). The digital economy of one of the most dynamic and fast-growing economies in Southeast Asia, Indonesia, is expected to account for 61 per cent of the country’s GDP by 2022. When Indonesia successfully campaigned for a seat on the 2019-2020 United Nations Security Council last year, it marketed itself as “a true partner for world peace” and “a bridge-builder”. Tourism Minister Arief Yahya has agreed that Lake Ranau will be the site for holding international festivals through the Tour De Ranau to boost tourist visits to South Sumatra. The National Police have arrested an American national who was growing marijuana inside his apartment in Tanah Abang, Central Jakarta. The Ministry of Agriculture and provincial authorities have been working with over 16,000 smallholders since 2013, in East Nusa Tenggara (NTT) and West Nusa Tenggara (NTB) provinces to help them adapt to climate change using a special technique called conservation agriculture. Two Malaysia-flagged wooden boats with nine Thai crew members aboard were detained by the Indonesian authorities for alleged illegal fishing, but it later ran aground off Kutaraja fishing port in Lampulo, Banda Aceh, Aceh Province. The Jakabaring Sports City (JSC), located in Palembang, South Sumatra, will become a flagship tourist attraction in Indonesia. 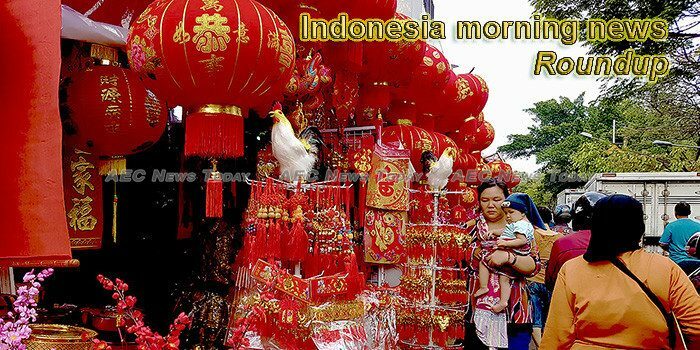 This week’s Indonesia morning news feature photo acknowledges Chinese New Year, 2019.